The 1st Middle East - Europe Forum (MEEF) for the “Collaboration in Translational Research for a Sustainable Future” took place on Kish Island (Persian Gulf), from 19 to 21 October 2018. The Forum's aim was to craft a way forward for research in promoting innovation and solutions as well as for support of prosperity and a sustainable future, by identifying common initiatives that would enable universities, researchers and key stakeholders to engage in effective collaboration and sustainable development. In the framework of the Forum's spectrum of issues that impact on and can help drive research collaboration on issues of sustainability, four areas were selected to serve as the focus of substantive sessions. The four major tracks that the MEEF focused on were namely: i) Water; ii) Renewable energy; iii) Non-Communicable Diseases (NCD), and iv) Urban issues and solutions. The event was prepared, hosted and executed under the aegis of five leading Iranian Universities. 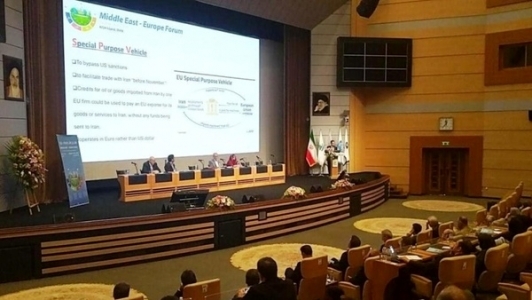 The Forum was attended by around 200 decision makers, researchers, academics and relevant stakeholders from industry, foundations and civil society, from altogether 10 countries in Europe and 5 countries in the Middle East. Dr. George Bonas, Managing Director of CeRISS, delivered a speech at the "Bi-regional Collaboration Panel" during the first day of the three-day Forum, regarding the Bi-regional Middle East – Europe STI cooperation, making also reference to the “Recommendations for an Enhanced EU-ME STI Cooperation” prepared by CeRISS under the MERID H2020 project. He also took part at the "Concluding Panel on Concrete Initiatives Roadmap" and acted as Rapporteur of the parallel session on "Renewable Energy Sources". The programme of the Forum is available here.